I'm so thankful to have a kitchen to cook in and a chance to finally prepare a meal. Last night's burgers were great but even still, it was a quick dinner that didn't require too much thought or preparation. I've been craving some pasta so tonight, I whipped up this dish to make use of some of the pantry staples I stocked my new kitchen with. This dish highlights how well lemon and thyme works nicely with poultry. Making a rich and creamy sauce using lemon zest and thyme, it's paired with Italian seasoned chicken that's crispy and flavorful. Rounding it all out with pasta makes it a hearty meal, especially paired with a refreshing green salad. I particularly like this dish in the spring since the lemon and thyme are light flavors for the season but this pasta dish is great any time of year! Heat 3 Tbsp oil in a large skillet. Cook chicken breasts over medium-high heat until golden brown and crisp (2-3 min). Add more oil for each batch as necessary. Place cooked chicken breasts on a baking sheet and transfer to preheated oven. Bake for 10-15 minutes or until internal temperature reaches 165°F. While chicken is baking, create the Lemon Thyme Cream Sauce. In a medium saucepan, melt 1 tablespoon of butter over medium heat. Add the chopped onion and cook, stirring often until the shallot is translucent. About 1-2 minutes. Add the wine to the sautéed shallot pot. Cook over high heat until the wine is reduced by half, about 2 minutes. Add the cream and the thyme and turn down the heat to a simmer. Cook until it reduces by half. Add the lemon juice and salt and pepper to taste. Add the hot pasta to the sauce and toss to coat. 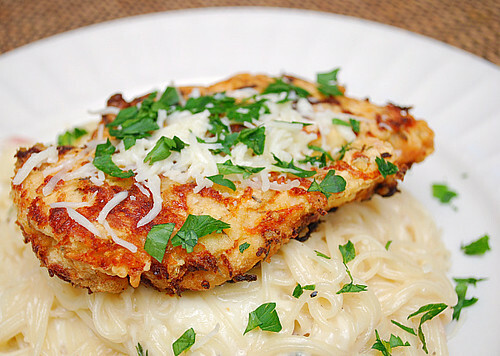 Plate the pasta and top with chicken. Garnish with Parmesan and parsley. That chicken and the cream and white wine laden sauce sound fabulous! I love chicken a lot and this is something I would crave for! Thanks for posting! Looks like a wonderful dish...love it! Made this yesterday, but instead of the Italian Chicken I fried it (since I had leftover onion ring batter), absolutely amazing lemon thyme cream sauce!!! My fiance finished his plate first & started eating mine! Definitely adding this to my favorite recipes!